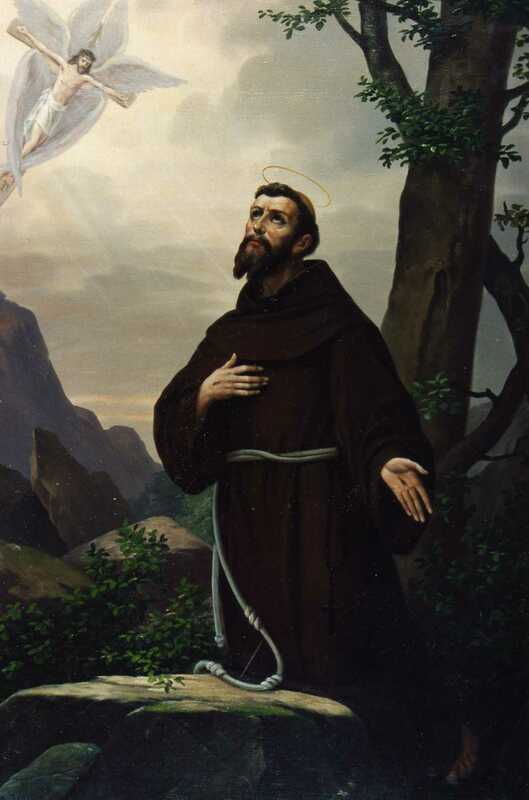 Despite real, living human beings like one old woman in Chasing Francis who declared in horror, “Isn’t Francis of Assisi a Roman Catholic Saint?” many people love St. Francis, Christian and otherwise. Among the Christians, friends of Francis are found across denominational and theological boundaries, with “Low” and “High” Anglicans loving him, “liberals” and “conservatives” being inspired by him, “evangelicals” and “progressives” chasing him. So let’s get Francis to cut through all the barriers and labels and help us see what a real Christian looks like! Ecologists love St. Frank because he was green. He preached to animals and rejoiced in creation, seeing it as a vehicle for the beauty and glory of the Creator. If he were to see what we do to the planet today, he would be shocked and appalled. He would call out for us to stop, to take a look at Sister Earth and her moaning, to see that the majestic trees are our fellow creatures, made by the same loving God! Yes, the earth is ours to till, to use, but not to abuse or destroy! We must be stewards of creation, not overlords. Evangelistic evangelicals love Francis because he was a gospel preacher before he was a creation-lover. He and his friars would preach to poor that they had to repent, that the Kingdom of Heaven was nigh. They cared about and for the poor spiritually in a time when many reserved the gospel of salvation for the rich and noble. They preached a gospel of the extravagant love of God in an age of hellfire, brimstone, Crusades, and indulgences. St. Frank believed that everyone had a chance of heaven, and he wanted them to have that chance. He loved Jesus and he wanted everyone else to see why Jesus was worth loving. Social activists love St. Frank because he bathed the lesions of lepers. Once, when the brothers gave him a cloak because it was a cold evening, he gave it to the first freezing beggar that he saw, then proceeded to thank the beggar for giving him this opportunity for generosity. The message of repentance the little brothers brought to the rich and powerful was that of mammon, of money and its grip on life. Sometimes they didn’t use words, and this was effective enough for many rich young men to sell all they had, give to the poor, and go join the little brothers. At other times, if the brothers were at prayer and a rich man rode by in his carriage, one would stand and preach about the evils and money and the deception on wealth while the others continued at prayer. Mystics love St. Francis of Assisi because he was one. He would spend days in prayer — spontaneously. Once he was walking with some of the brothers and became overcome by an urge to pray. A friend had a place nearby, so they went there, and St. Francis spent the next three days in prayer. Another time, when he and St. Claire were deep in conversation for hours and their spirits were caught up in the heavenlies, the locals ran to the building because it looked like it was aflame. But when they went in, they saw that the light was produced by a gathering of the saints with Francis and Claire. St. Francis had visions of the Blessed Virgin Mary as well as the stigmata. The event that started his ministry was a vision of Christ. Why do you like St. Francis of Assisi? Adapted from a post originally situated here. St. Clare of Assisi was probably St. Francis’ (saint of the week here) best friend. 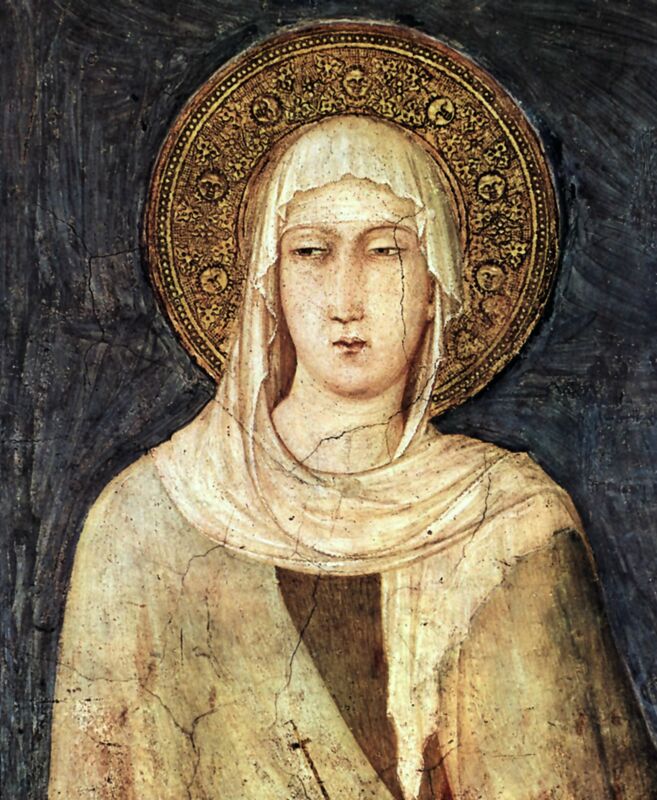 She, like Francis, came from a wealthy family in Assisi, and abandoned it all for the Gospel — which for a woman in thirteenth-century Italy was a lot harder than for a man; she had to run away from home basically and escape out of an arranged marriage. Having made the Laudable Exchange (blogged here), she joined up with Francis. Since the Church of the Middle Ages did not have a place for women in the wandering, preaching work of mendicants, she and her sistren who also abandoned the world lived the cloistered life. The order she founded is the Poor Sisters of St. Clare, the nuns who are the female counterparts of the Little Brothers. Now, the thirteenth century was still the Middle Ages, and Sts. Francis & Clare were out to change the Holy Catholic Church from within, not start a hippie commune (as it looks in Brother Sun, Sister Moon) with Donovan leading the Gregorian Chant. The Poor Clares lived separately from the Little Brothers; mediaeval monastics, no matter how counter-cultural, knew well the temptations and lusts of the flesh. Having large quantities of unmarried men and women living in close community is not necessarily conducive to righteous living. St. Clare is another reason we love Franciscans. St. Francis treated her as an equal, as a friend, as a sister. Many great things there are about the Middle Ages, but the treatment of the average woman by the men around her is not one of them. That Francis and Clare were such good friends is a testament to the power of the Gospel to transform lives. Their friendship is also one of those beautiful spiritual bonds that many of us long for, such as between St. John of the Cross and St. Teresa of Avila, or St. Basil the Great and St. Gregory of Nazianzus. They would meet and discuss the things of Christ into the wee hours, unconscious of the passage of time. Their conversation and prayers would get caught up into the heavenly realms as these two mystics sought the glorious Trinity together. O God, whose blessed Son became poor that we through his poverty might be rich: Deliver us from an inordinate love of this world, that we, inspired by the devotion of your servant Clare, may serve you with singleness of heart, and attain to the riches of the age to come; through Jesus Christ our Lord, who lives and reigns with you and the Holy Spirit, one God, for ever and ever. Amen.